A great read for children and great for reading around a fire on a cold winter night! We have to thank C. J. Tibbits for collecting and translating these tales. In the main he drew them from previous collations by Thiele, Hylten-Cavallius, Stephens, and of course, Asbjörnsen, Moe, and, not forgetting, the Prose Edda. 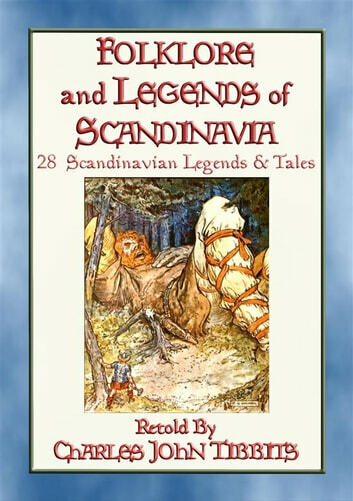 Scandinavian Folklore is well to the front. Its treasures are many, and of much value. One may be almost sorry to find among them the originals of many of our English tales. Herein you will find 28 old legends and tales drawn from across Scandinavia - Denmark, Norway, Sweden and Finland. Some will be familiar but most, less so. These may even seem to be a refreshing new find for, you, the reader. Even if you haven’t read some of these stories, you can rest assured that all will entertain. You can also be sure the general lesson these stories convey is the sure punishment of vice and the reward of virtue; some way or another the villain always meets with his just deserts – just as Fairy Tales are meant to be. How A Lad Stole The Giant's Treasure. The Hill-Man Invited To The Christening. Maiden Swanwhite And Maiden Foxtail. Thor's Journey To The Land Of Giants. How Loki Wagered His Head. The Adventures Of John Dietrich. So, after you have downloaded this unique volume, find a comfy chair, sit back with your reader and a steaming hot beverage and be prepared to be entertained for hours.